My husband Craig and I were married last fall. When planning the wedding we seemed to have everything organized except for the most important aspect…who would we find to marry us?! Neither of us are religious, but with parents that have been married a combined 74 years, we wanted the ceremony to be special as our families take the institution of marriage very seriously! After asking around we were finally referred to Jeff Sabin. I first e-mailed Jeff and he suggested that we discuss the details of the ceremony over Skype in order for us to meet face to face as we were running short on time and a meeting in person wasn’t in the cards. I could tell that Jeff was very kind and calm through his e-mails, but after talking to him on Skype, I knew that we had made an absolutely fantastic choice to have him as our officiant. It was a huge relief! Jeff enabled us to choose our own flow for the ceremony by providing us with a number of programs that had been used by other couples. We then created our own format and we absolutely loved this aspect of working with Jeff as it made us feel very connected to the ceremony! When it came to the rehearsal and the actual wedding day, Jeff was prompt, professional and incredibly calm. Jeff helped to make our wedding day a dream come true. I can’t thank him enough and I would highly recommend him to anyone who is interested in his services! When my husband and I set upon the seemingly daunting task of looking for someone to officiate our wedding from 250km away, and with only two months to plan it, we knew only one thing…this person would be one of the most significant contributors to our Wedding Day experience (other than us of course!). Admittedly, we had a fairly long list of ‘must haves’ when we began our search. We were looking for someone who would not simply ‘marry us’, but someone we felt completely comfortable with, someone who would guide us through all the legal and emotional components of creating OUR perfect Wedding Ceremony, someone with a voice that was both tender and confident, someone with a sense of humour, and someone who had the capacity to calm us on our Wedding Day should our emotions get the better of us (which they did by the way). We found all of these and more in Jeff! While Jeff wasn’t the only person we called, our decision was made after our first conversation with him. His voice, his friendly approach, his openness to our needs, and his warm, engaging personality told us ‘he’ was the one we wanted to carry our day. Jeff warmly invited us into his home on several occasions before the wedding to get to know us as individuals, as a couple and to mentor us through this most significant day of our lives. What I recall most about the first time we met was his smile, and his eyes. Jeff’s warmth and generous spirit literally dances out of him through his eyes. We wanted to write our own ceremony, and our own vows, and exchange them on our Wedding Day unprompted. Jeff provided us with samples of ceremonies, guided us on the legal requirements that needed to be included, and provided prompt, positive and supportive responses to us when we sent him our ‘draft’ ceremony. He also walked us through the timing and experience of applying for our marriage licence which turned out to be exactly as he described it would be – no surprises – even better than a YouTube video! On our Wedding Day Jeff arrived 30 minutes before the ceremony and engaged my husband in buoyant conversation which helped to keep him calm. When my emotions began to swell just before the exchange of vows, I looked at Jeff and his warm, smiling eyes literally radiated an instantaneous sense of calmness to me. My husband found the same source of inspiration in Jeff. Gratefully we were both able to share our vows intimately, and unprompted. This ability of Jeff’s was not something we thought to include on our ‘must have’ list, but in our experience, it is one of his greatest assets! In the end all we can suggest is that if your search for your perfect Wedding Day experience has led you to Jeff, look no further. He became a vital and ‘honourable’ member of our Wedding Day family…from beginning…to end. He brought to us an experience beyond what we had even conceived of…and for that we are ‘forever’ grateful. We made the right decision in choosing Jeff Sabin as the officiant for our wedding: he is knowledgeable, personable, warm, and professional. Jeff can answer any questions you might have about the marriage process and is more than happy to help you. He helped make our day that much more memorable for all the right reasons. Been wanting to contact you to tell you how grateful we were to have your calming, warm and generous spirit with us on our big day! We loved it! A huge part of the relief and relaxing came for me after we had our rehearsal and I realized that I had to let that beast go and just enjoy the moments! Thanks for your words, reassurances and confidence. We are so very pleased that we ended up finding you to officiate our wedding. Organising our Bayfield wedding from Australia was an exercise in faith and electronic communication. Your warm, but professional online profile grabbed our attention and working with you to design a ceremony that was uniquely us, all via email, was enjoyable and easy. When we met with you just prior to our wedding day we both felt instantly relaxed and happy with our decision. We had a great chat and welcomed your warmth, good humour and confidence as well as all of your great suggestions for those simple yet important details that we hadn’t thought through such as: which arm should we take? where should we stand? how should we be prompted if we do the ‘dear in the headlights look’ as you call it. Thank goodness you suggested and willingly attended a rehearsal the night before at no additional cost to us! I think that was very beneficial. As for the actual ceremony, we could not have been happier. I received a number of compliments from young and old about you. Mainly, our guests appreciated your professionalism balanced with warmth, your confidence and your clear voice, which I note resonated perfectly without amplification in our garden venue. You told us you would arrive 30min prior to and you were prompt as always. You were perfectly attired for the venue. You put Chris at ease and you were a welcome sight for me too on approach. A special thank you for your willingness to include our two young children in the ceremony. Their little paw prints on the marriage licence makes it all the more treasured. And your extremely thoughtful gift of the O.P.P. teddy to my four year old son made him feel very special and opened him up to you which no doubt made him a great ‘ring-master’. You will be happy to know that the O.P.P. teddy made the long flight home in cabin and is now keeping law and order in Mt Martha. Above all Jeff, you reminded us that the most important thing is that the ceremony is genuine and warm. Although it was pretty much perfect in my mind, it need not be. It is a celebration of love together with friends and family and the little things that may happen along the way only serve to make it more real. It is just wonderful that you have chosen to pursue this meaningful role as the next phase in your long public service career. I have no doubt you will enjoy well-deserved success. Terri and I are settling into married life and wanted to send you a big thank you. Our wedding was perfect and everything occurred just as we had hoped. You did such an amazing job working with us and the wedding party to ensure our ceremony flowed. Your Professionalism, openness and flexibility helped us create our own unique ceremony that we were able to share with our family and friends. Thanks again for being apart of our special day that we will cherish forever. Now that we’re back home and (somewhat) settled in again, I want to thank you for walking us through the process so calmly and making it feel so effortless! The ceremony options you provided were invaluable in creating a ceremony that was absolutely perfect and meaningful to us. We heard many comments about how wonderful the ceremony was and there were still lots of tears at the receiving line! Jeff was exactly who we wanted to marry us. He is funny. He was more then happy to change things up during the wedding ceremony with the bible readings and being part of this surprise wedding that Jeff and my husband had worked out together for me. I would strongly recommend Jeff. Jeff, Also just wanted to say thanks for the wonderful service – we really enjoyed meeting you and appreciate the way you made us feel at ease throughout the process – we couldn’t have been happier with everything. Thank-you so much for the role you played in our special day. We really appreciated your calm, kind, professional humorous manner. You were so great to work with through the entire process. From planning to rehearsal and the ceremony-it was all such a wonderful experience that we will remember for a lifetime. Thank-you for truly loving what you do and for your help and guidance to make our ceremony everything we dreamed it would be. We wanted to say thank you from the bottom of our hearts for being part of our special day! We feel so honoured that you were the one who married us. You were absolutely wonderful from the very beginning, so supportive and helpful and extremely patient with us. We loved that you added some humour to the ceremony. You are truly amazing at what you do and we can’t thank you enough. Thank you! Jeff, I just wanted to say thank you a million times for officiating our ceremony last weekend. Knowing you personally definitely made it more special, but even if I hadn’t known you before it would have been wonderful. You are so kind, professional, and funny – it would make any bride and groom comfortable during a stress full time. I keep getting compliments from everyone who attended – you were amazing. You had fun with it, you let us make the ceremony our own, and you added some clever personal touches to it that made it even more memorable. I will recommend you to everyone and anyone who asks – thank you from the bottom of my heart. We were introduced to Jeff Sabin through the Hessenland Country Inn and were immediately taken with Jeff’s warmth and sense of humour. His enthusiasm and open-mindedness (wedding was on Halloween) to “marry” us was wonderful! Jeff gave us some great options for our vows and played along with our own version of things which we greatly appreciated. Thanks Jeff for your flexibility and great support! Hi Jeff, I want to thank you for being such an amazing officiant for John and my wedding on Sunday! You made us both feel so comfortable, despite the rain and slight location change, the ceremony went perfectly and your words were well spoken and beautiful. I didn’t get to thank you or goodbye that day, things got busy! I will remember that day forever, and especially the ceremony. Don and I just want to say thank you again, you really made our day so special. The service was perfect. I will recommend you to our family and friends for sure. Jeff….thank you for being such a big part of our wedding….was a great day with great people. My husband and I decided to get married in Goderich as we had fallen in love with a venue there, even though we lived about 3 hours away at the time. I was a little concerned about how I was going to plan a wedding from that distance and where the heck we would find an officiant, so I resorted to good ol’ google. I came across a few different websites, but when I saw that Jeff was a retired OPP officer I knew he was the one we had to meet since my husband is a police officer as well. I met him on my own the first time and while we sat in his backyard discussing my vision for the wedding he put me instantly at ease. He was laid back with a great sense of humour and he told me that the day could be anything we wanted it to be, and that as long as it was legal he would do it, and he wasn’t lying! He was open to any and every suggestion I threw at him and was even genuinely excited when I asked if we could include our dog, Rex. I left that day feeling very excited as he had surpassed all of my expectations. Soon after, Jeff sent us a bunch of different ceremony outlines to look over and we were able to mix and match bits and pieces of each of them along with some of our own ideas to create a ceremony that was so perfect for us and our personalities. We met with Jeff again a few months later and my hubby was just as impressed as I was. We had Rex with us that time as we had been coming from a campground in Goderich, and he even came out to our car to meet him and brought out a doggy treat for him. Jeff went through the whole ceremony and thought of all of the tiny details that we would need to know. He also reminded us how important it would be to be in the moment on that day. He reassured us that he would be our guide that through every part of the ceremony and we did not need to worry about what was next or think ahead, we just needed to focus on each other and the importance of the day and moment and to leave everything else to him. As the months flew by and the wedding got closer I would email Jeff if I had any questions about the wedding and he was always very quick to reply. He even went above and beyond to help out when I had questions about the area, like where I might be able to find a bartender or where the best place would be to find cheap ice. Jeff came for our outdoor rehearsal and there was a storm rolling in so we had to improvise and start a little early (without our full wedding party) and do the quickest run-through ever (and we still got soaked in the end). Even with late arrivals, rowdy, non-attentive groomsmen, a few dogs running around, two children in the wedding party and thunder rolling in, Jeff was able to calmly handle the crowd and make sure we knew what we would need to know for the next day. He then joined us for our rehearsal dinner after and I’m pretty sure the table he was sitting at had the loudest laughs of any- he fit right in with both our family and wedding party. The day of the wedding he was early and ready to rock. He kept the groomsmen in line, had our guests both laughing and in tears, and was able to improvise when the emotions of the day were a bit overwhelming to my husband’s 6 and 10 year old sons who were standing up there with us. He made the ceremony so personal and fitting to us as individuals and our personalities, and he even had kleenex ready to go when I ended up needing it. We were so incredibly happy that Jeff was able to be part of our day and we know that his relaxed nature, calming presence, sense of humour and willingness to tweak the ceremony to make it fit our personalities so perfectly contributed greatly to making our day so amazing. Thank you Jeff for everything, we were so lucky to have met you! Thank you very much for being our wedding officiant! You came highly recommended to us and you definitely didn’t disappoint! We really appreciate you taking the time to get to know us and helping us choose the right words for the ceremony. Being there for the rehearsal and walking us through really helped us relax and helped the ceremony run so smoothly on our special day. We really appreciated everything you did for us and ho accommodating you were with our sudden date change. You were absolutely wonderful to work with and a lot of fun and we will certainly pass your name along to anyone who is looking for an officiant! Thanks again! I just wanted to say thank you so much for everything you did for our wedding. We had a spectacular day and you were a huge part of that. Thank you for getting us where we needed to be through the ceremony because we were both very emotional and heads get a little foggy when that happens. We had so many compliments about you throughout the night, people saying how much they loved your presence and confidence and sense of humor. And to have a cookie in your pocket for Freya, that was above and beyond. You were the perfect person to have officiated our wedding. Thank you for being a part of our special day. Just wanted to send out a huge thank you to you Jeff . The day was perfect and you did an amazing job. We were so relaxed and knew we were in good hands with you leading us all the way . Thank you Thank you . I just wanted to say a big THANK YOU for officiating our wedding. I appreciate your excellent communication from the beginning – making time to officiate our wedding at short notice, making time to talk with us over Skype, explaining the process to us and making us feel comfortable. The ceremony itself was beautiful, majestic, more perfect than we could have imagined. I love how you held the ceremony with just the right balance of lightness and weight, how you made me feel at ease, and allowed the ceremony to be all about my beautiful bride and me – for the most part, I didn’t even notice that anyone else was there! Two weeks in, and married life is going well so far 🙂 We just moved into our new house yesterday! We just wanted to thank you again for performing our ceremony for us! All of our guests thought you were the perfect guy for a perfect day! Awesome job Jeff! We appreciate it so much! Thank you so much for EVERYTHING yesterday! It was the PERFECT day and you had a huge part of that! You made the day so much easier! There is no way we could have had a more perfect officiant to perform our ceremony on our wedding day! The ceremony was perfect and we have you to thank for that! You somehow managed to keep Dylan relatively calm and you made everything run so smoothly! Overall, made everything so much easier with your fun, outgoing personality! Thank-you so much for being our officiant! We cannot say enough about the excellent job Jeff did as our officiant this summer. From the beginning of the process right through to the big day he was professional and personable, caring and accommodating. He was both a great guide through the ins and outs of the ceremony and a calming influence during the ceremony itself. Just to know that we were in the hands of a professional like Jeff allowed us to relax and enjoy the moment, safe in the knowledge that everything was going to run smoothly. An officiant sets the tone for not only the wedding ceremony but the evening to follow, and Jeff made sure our guests left the ceremony feeling joyous and excited for the night ahead! If you’re currently searching for an officiant, I assure you that with Jeff you will be in very good hands. The wife and I celebrated our 25th wedding anniversary on Oct 2nd, 2018. I planned a getaway to the beautiful town of Bayfield in Canada. On short notice I contacted Jeff to see if he would be available to renew our vows. Not only was he available but also suggested a wonderful photographer to memorialize this special occasion. It was great to know that after 25 years I can still surprise and put a smile on my beautiful wife’s face! Thanks again Jeff, you were truly awesome! 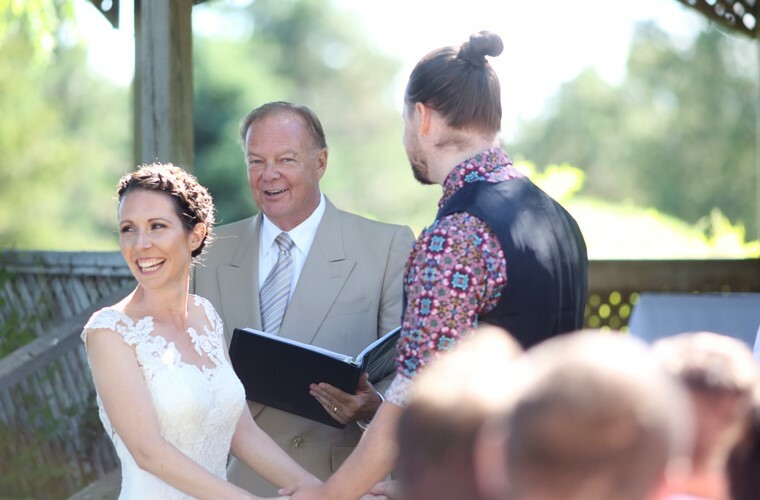 My wife and I recently had Jeff Sabin officiate our wedding ceremony at the Benmiller Spa and Inn in Goderich. From the first time we met Jeff to the actual ceremony he made us feel at ease throughout. He gave us great suggestions for the wedding vows and to help with how the ceremony would go. We were thrilled with his services and would strongly recommend Jeff to anyone looking for a very professional and respectful wedding commissioner.